Creativity can be viewed as a sequence of behaviors that are multi-dimensional in nature. It is the development of an original idea that serves some purpose or need or is influential. Groups consist of two or more people who share some common sense of purpose and are in a position to interact at some level. There are two types of creative thinking. Paradigmatic creative thinking involves using small, incremental steps to arrive at a new idea. Revolutionary thinking results in unexpected and path-breaking insights that are revolutionary in nature. In any organization, a creative idea has the ability to open up newer opportunities for growth and profit. Many organizations today are made up of teams that collectively approach a problem and find solutions. A team provides the opportunities for diversity in the ideas that are put forward. 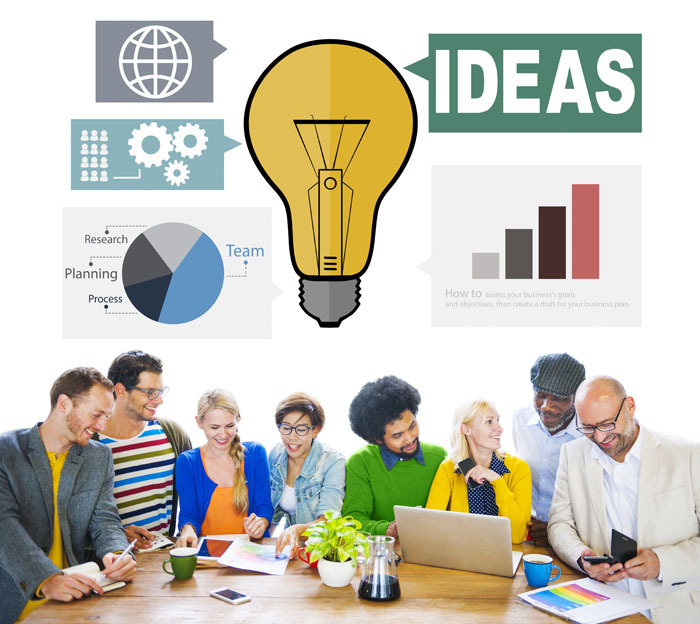 These ideas will easily outnumber those that any single individual can come up with. While the argument exists, that a group has the potential to generate a number of creative ideas, it must be accepted that as a rule most organizations do not encourage divergent thinking and train employees to follow established rules and protocols. There are set guidelines laid and there is a reluctance to accept change or new thought. But with many companies today proving to be successful by encouraging creativity in their teams more people are starting to look at ways in which creativity can be introduced in groups. A single flash of insight never solves a problem single-handedly. Every idea is by nature inspired by something or someone. Great innovations are generally born out of collaboration between people. When people come together, creativity gets unleashed, concepts start flying and the end product is better than all the individual components put together. In a group, the different members of a team should feel free to put forward their diverse perspectives. They should not make the mistake of suppressing unique information that they can provide by focusing on the common, shared knowledge of all. A problem with collaborating is that only one person can present an idea at a time. This may stifle creativity in some, as they are limited in expressing ideas that are being stimulated within them. A possible solution here would be group writing or using computers to input one’s ideas while monitoring the ideas of others. For creativity in a group to be successful, it is essential for the creative process to be managed carefully. The first stage–preparation, involves carefully selecting members for a team so as to ensure that the potential for creativity is maximized. The next stage is to identify what the problem is that requires creativity. This is the innovation opportunity. Once the problem is identified, a number of possible ideas are generated using divergent thinking. These ideas are then incubated to allow for careful evaluation. The last stage involves arriving at a consensus on the best idea or innovation. 1) Innovation emerges over time: Any innovation is the outcome of a number of small ideas contributed by many. These ideas go through the process of being improved on and eventually emergeas an innovation. 2) Deep listening is practiced by successful teams: Members of a team should focus on paying attention to the ideas of others in order to come up with effective feedback or suggestions for improvement. When ideas are being put forward, an individual’s preoccupation with thinking about what to say next will impact how he contributes to the ideating process. 3) Ideas should be built upon: Any great idea never belongs to a single individual. It is the outcome of bettering or extending ideas that are put forth and taking it in the right direction. Therefore inputs from multiple individuals come together to inspire/generate the ultimate idea. 4) It takes time for an idea to become clear: Ideas when first expressed are just thoughts of individuals but when they are taken up, reinterpreted, questioned or applied by others, they acquire their full meaning. 5) New and unexpected issues or questions emerge: A group that is creatively collaborating can at times identify new problems and new perspectives of looking at something. The ability of creative groups is not restricted to solving existing problems alone, it extends to finding newer questions that require answers. 6) Innovation is inefficient: The process that leads to an ultimate innovation sees a number of good ideas, bad ideas and some unexpressed ideas. Some ideas are phenomenal and make up for the bad ideas that one encounters on the way. 7) Innovation emerges from the bottom-up: An innovative team can restructure itself to fit any environment. Improvising helps to work from smaller details to create the big picture. Innovations born out of improvising others ideas are so surprising and imaginative that it is very unlikely that a single individual could have come up with something similar.